hvis du har mod på at hjælpe hermed, eller du har tilføjelser, korrektioner til oversigten. A'albiel An angel in service to the archangel Michael. Adnachiel This angel holds dominion over the sun sign Sagittarius. Those who were born under this sign can pray to Adnachiel for special protection and blessings. We can all pray to this shining one for the spirit gifts of independence, honesty and gregariousness. Af Bri An angel who exercises control over rain. Afriel Traditional angelic lore informs us that this being of light safeguards young life, and is also considered to be protective of that which is youthful and tenderly growing within each of us, no matter how old we actually are. Afriel is believed to grant youth, vigor and vitality and is prayed to for these gifts and attributes. Aftiel The angel of twilight. Aha An angel of the order of dominations, a spirit of fire used in cabalistic magical operations. Ahadiel An angelic enforcer of the law. Alimon A great prince who, when invoked, protects the invocant from gunshot wounds and from sharp instruments. His aids are the angels Reivtip and Tafthi. Amatiel Amatiel Holds dominion over the season of spring. We appeal to this renewing angel to plant the seeds of hope, rebirth, new beginnings and positive expectations in our hearts and minds. Ambriel This angel inspires clear communication so that we might better speak our own truth, while gently guiding human beings toward a time when truth and clarity will be the universal norm. Ambriel is also considered to be an angel of general protection. Ambriel presides over the sun sign of Gemini and the month of May. Those born under this sign pray to Ambriel for special blessings and protection. Anael One of the 7 angels of creation. Prince of the Archangels and ruler of the Friday angels. Anael exercise dominion over the planet Venus. He is one of the luminaries concerned with human sexuality and is governor of the second heaven, where he is in charge of prayer ascending from the first heaven. In addition he controls kingdoms and kings on earth and has dominion over the moon. Anafiel Chief of the crown judgment angels of the Merkabah. Anfial One of the 64 angel wardens of the celestial halls. Angels Of Childbirth There are 70 amulet angels invoked at childbirth. Angels of the Mansions of the Moon There are 28 angels ruling the 28 Mansions of the Moon. Angels of the 12 Months There are angels for each month of the year. Angels Of Prayer The seven angels who convey the prayers of the saints to our creator. Akatriel, Gabriel, Metatron, Raphael, Sandalphon, Sizouse and Michael. Angels of the Rain Matriel, Matarel, Matariel, Ridya and Zalbesal. Angels of the Seasons There are Governing and Serving Angels of the Four Seasons. Angels of Sunday Sunday is influenced by the Sun. Michael is the primary Angel of Sunday, but each hour of this day also has its secondary angel. These angels are, beginning with the 1st hour -- Michael, Anael, Raphael, Gabriel, Cassiel, Sachiel, Samael, Michael, Anael, Raphael, Gabriel, and Cassiel. Some Angels do double duty on this day! Angerecton An angel invoked in magical rites, specifically in the invocation of fumigation. Aniel One of the numerous angelic guards of the gates of the West wind. Anitor A high holy angel, invoked in magical rites after proper investiture by the invocant. Anixiel One of the 28 angels governing the 28 mansions of the moon. Anthriel This is an angel of balance and harmony we appeal to Anthriel to help us stay on an even keel, leading our lives with moderation. Anthriel helps us stay calm at all times. Those who become easily off-centered and filled with anxiety pray to Anthriel for balance. Aquariel This perfect being opens the doors of perception to mortals who pray to him. Aquariel inspires humankind with transcendent and cosmic understanding so that we may spiritually evolve. Arariel (Azareel, Uzziel) Curer of stupidity and one of the 7 angels with dominion over the earth. Arariel is specifically an angel who presides over the waters of the earth (according to the Talmudists). He is invoked by fishermen so that they may, with luck, catch big fish. Archer A governing spirit of the sign Aquarius. Archons(Rulers) Angels set over nations and identified or equated with aeons. Archons are primordial planetary spirits. Other archons are Uriel, Michael, Raphael, Gabriel, Shauil and Cassiel. Ardouisur A female cherub. Among her attributes are making females prolific and giving them easy childbirth, also supplying them with breast milk. She is sometimes called "the giver of living water". Ardousius Traditional angelic lore tells us that this angel is a female angel who is believed to help and protect during childbirth and who also inspires breast milk to flow. Pray to her for nurturing love. Arel An angel of fire. His name is inscribed on the seventh pentacle of the sun. He can also be invoked in ritual magic. Arias Angel of sweet smelling herbs. Ariel/Ariella Hebrew: Lioness of God; air or water spirit (angel); ethereal. Assasiel Angel of Thursday, who shares his rule with Sachiel and Cassiel. Assasiel is also one of the presiding spirits of the planet Jupiter. Ashriel One of the seven angels with dominion over the earth. He is the angel that seperates the soul from the body at the time of death. He can also be invoked to cure stupidity. Ataphiel An angel who supports heaven with three fingers. Atel An angel of the fourth heaven. Also an angel of the air ruling on the lord's day evoked from the East. Athanatos A conjuring spirit of the planet Mercury. Name of the god used to discover hidden treasure and in the cabala, a spirit invoked on the general citations of Moses, Aaron and Solomon. Attarib One of the four angels of winter and head of the sign of winter. Atuesuel One of eight angels of omnipotence. He is invoked to "smoke out the monsters of hell." Auriel (Light of God) One of 72 angels of 72 quinaries of degrees of the zodiac. Invoked in conjuration of the sword. Ayib A spirit of the planet Venus who's name is inscribed on the fourth pentacle of that planet. Azbuga(h) One of the 8 great throne angels of judgment who clothes with the garment of righteousness those deemed worthy among the new arrivals in heaven. Azer Angel of the element fire. Azrael The Angel of Death who is "forever writing in a large book and forever erasing what he writes: what he writes is the birth of man, what he erases is the name of the man at death." Baal - A deity that was worshipped regularly throughout much of the ancient Near East, particularly by the Canaanites. The name is derived from the Semitic word meaning "possessor" or "lord" and was used as a common noun with many applications; overtime, however, Baal was adopted as the chief fertility god, a master of the world, and the lord of rain, whose benevolence in supplying moisture was essential to the flowering of crops. By the time of the Israelites' arrival in the land of Canaan, the worship of Baal-was firmly established. Baal even came to be understood as representing the Lord of Israel. Bagdial A corpulent angel in charge of issuing cards to recent arrivals in the lower heavens. These cards entitle them to new bodies. However Bagdial is said to be a fictional angel. Ballaton An angel whose name is used by sorcerers when drawing the potent pentagram of Solomon, a symbol used for summoning spirits and conducting esoteric rites. Baraacata An angel who figures in the ancient and very arcane rites of magic associated with King Solomon. Baracata may not be precisely considered an angel, but traditionally it takes a sorcerer of considerable powers to summon him. Barakiel (Barkiel, Barbiel) This benevolent one grants success, good fortune and excellent luck to mortals who pray to him. He also inspires joviality and a sense of humor. When we pray to this angel on a regular basis, we find that we become filled with happiness, our hearts expand, and we make a space for this angel of good fortune to enter. Rules of the order of seraphim, governor of the month of February, and one of the 7 archangels. Baraqiel One of the seven great angels in control of the seven heavens. Baraqiel is one of the "great, beautiful, wonderful, and honored princes" listed in the Third Book of Enoch, that extensive compendium of angelic lore. His specific heaven is the second heaven. Baraqiel is counted as the angel of lightning, joined by such other angels as those of the sun, hail, earthquakes, snow, etc. It is possible that Baraqiel is also to be identified with the fallen angel Baraqyal. This angel considered one of the angelic beings-with Uriel and or gambling. Baraqyal An angel who belonged to the so-called Watchers, who descended from heaven to cohabit with mortal women. In the Book of Enoch, Baraqyal is listed among the two hundred fallen angels and was ranked among the chief of ten, the divisions of the evil an repentant angels. As a demon, Baraqyal is able to teach those who summon him the secret arts of astrology. Barattiel One of the great angelic princes listed in that famed compendium of angelic lore, the Third Book of Enoch. Barattiel has a specific place in the angelic hierarchy presented in that work, being situated between the angelic princes Tagas and Hamon. When Tagas sees Barattiel, he falls upon his face prostrate and removes his princely crown. Likewise, when Barattiel beholds Hamon, he falls down prostrate and removes his own crown. Barattiel has the special post or power of literally holding the highest heaven-called in this tradition the Arabot-on the tips of his spread fingers. Barkiel Angel of lightening. (Uriel also has had this title) Barkiel is also one of the angels of February and is cited as one of the archangels. The angel of lightening is also noted as the only angel successful in fighting the demon envy. Barpharanges An angel in charge of the spring of waters of life. He is the angel of the baptismal. Bathor One of seven Olympian spirits, known as stewards or electors of heaven. Bat Qol - Also Bath Qol, an angel, often spoken of as female, whose name means "heavenly voice." the angel is said among the Syrians to have the voice heard by Cain asking "Where is thy brother, Abel?" after Cain murdered his brother. Bat Qol is also said to have visited the famous second-century A.D. rabbi Simion ben Yohai (the supposed of the Jewish mystical work the Zohar) while he was imprisoned. 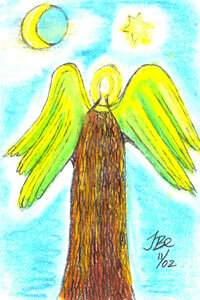 in the sense of Bat-Kol, the angel can represent the divine voice that announces the will of God. Beburoa An angel mentioned in the apocryphal book the Revelation of Esdras. Beburoa is ranked as one of the nine angels who will come and reign over the end of the world. Bene Elohim Also bene Elim, a group of angels who belong to the order or choir of thrones. Meaning "sons of God," the bene Elohim are considered a part or division of the thrones, receiving the duty of forever singing the ineffable praise of God. As the sons of God, they are sometimes counted as the beings mentioned in the Book of Genesis (6:2) who save the daughters of men "and took to wife such of them as they chose." The result of this union were the giants, the anakim, "the mighty men that were of old, the men of renown." The bene Elohim are also thought to be the angels called the ischim. Bethor - A powerful angel, one of the seven angelic beings ruling the 196 divisions of heaven. To assist him in his work, Bethor commands some 29,000 legions of angels. His area of authority also extends to everything related to the planet Jupiter, part of the ancient belief of each planet, star, and phenomenon of nature having its own angelic patron or ruler. Blaef A Friday angel of the air and subject to the west wind. Black Angels A name used, especially in Islamic lore, for the fallen angels. Black angels are generally considered demons. The two most famous fallen angels by this appellation are Nakir and Monker. Boamiel An angel mentioned in the obscure Jewish mystical work the Book of the Angel Raziel and ranked as one of the angels with authority over the four divisions of heaven. Boel (God Is In Him) One of the seven exalted throne angels, resident in the first heaven. Boel holds the four keys to the four corners of the earth. He governs the planet Saturn as well. Bottomless Pit, Angel of The The angel who has authority over the abyss, the bottomless pit, often also called hell. This angel is usually identified as Abaddon (or Appolyon). Abaddon holds the key and also has the duty (or perhaps the pleasure) of binding Satan for one thousand years. There has been some debate over the centuries concerning whether the angel of the bottomless pit is good or evil. Burning Bush, Angel of The The famous angel of the event recorded in the Book of Exodus (3:2) in which Moses beheld the burning bush.Some scholars prefer to say that the burning bush was not really an angel, but God assuming this memorable form. In one Jewish tradition, the name of the angel of the burning bush was Zagzagel. Calliel One of the throne angels serving in the second heaven, invoked to bring prompt help during adversity. Camael (Kemuel) (Kamael) Chief of the order of powers; one of the holy sefiroth; personification of divine justice; among the 7 that stand in the presence of God. An angel who presides over beauty, joy, happiness, and contentment, Camael grants these gifts to those who pray to him. Any activity on our part that emulates this angel, such as bringing gladness to others, draws Camaelic energies into our lives and enfolds us in wings of happiness. 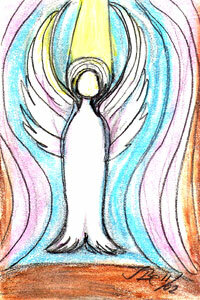 Essene prayer: "Camael, Angel of Joy, descend upon the earth and give beauty to all things." Cambiel This angel presides over the sun sign Aquarius. Those born under this sign can pray to Cambiel for special protection and bright blessings. We all pray to this shining one for increased intelligence and also for the courage to think in unconventional ways. Cambill Angel of the eight hour of the night. Caracasa An angel of spring along with Core, Amatiel and Comissoros. Cassiel Ruler of Saturday. The angel of solitudes and tears who "shews forth the unity of the eternal kingdom". Cassiel is one of the rulers of the planet Saturn and is also the ruling prince of the seventh heaven. Cassiel is one of the Sarim (princes) of the order of powers. Sometimes, he appears as the angel of temperance. Cathetel This guardian angel of the garden increases the growth and yield of vegetables and fruits and keeps them healthy and flourishing. Cathetel inspires the human race to love and appreciate all of the beings of nature. When we grow in respect and reverence for nature we can attain harmony with our own natures as well. Cedar An angel governing the South. Chabalym A seraph or cherub invoked in cabalistic magical rites. Chaldkydri Archangels of the flying elements of the sun. Linked to phoenixes and in between cheribum and seraphim. They have 12 wings and at the rising of the sun they burst into song! They recide in the 4th heaven. Chamuel This angel fosters tolerance in the human heart, inspiring within us the realization that to love others we must love ourselves. Chamuel helps us to drop judgmental attitudes towards others and develop a more tolerant view of our own shortcomings. 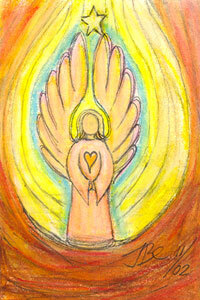 Charbiel An angel appointed to "draw together and dry up all the waters of the earth." Charms Angel of the ninth hour of the day. Charoum An angelic benefactor who presides over the direction North. We appeal to Charoum for the ability to appreciate silence, the integrity to keep secrets and the patient attentiveness to be good listeners. This heavenly protector is traditionally believed to safeguard the earth plane from excess rain, floods and hurricanes. Chasan Angel of the air his name is inscribed on the seventh pentacle of the sun. Chaylon A cherub or seraph invoked in ritual magic. Chayyiel Chief of the Holy Hayyoth (Cherubim). Cheriour A "terrible angel" charged with punishment of crime and the pursuit of criminals. Chermes Angel of the ninth hour of the night. Colopatiron As an angel who unlocks prison gates, we can appeal to this sacred being when we are struggling for freedom or independence of any kind: economic, creative, spiritual or psychological. Corabael A Monday angel residing in the first heaven and invoked from the West. Corat A Friday angel of the air, invoked from the East, residing in the third heaven. Cupra One of the Novesiles, Cupra is the personification of light! Dalquiel One of three princes of the third Heaven. The other two are Jabniel and Rabacyal. All rule over fire under the ethnarchy of Anahel. Damabiah An angel of the order of angels with dominion over naval construction. Dameal A Tuesday angel, resident in the fifth heaven. He is evoked from the East. Degaliel An angel who's name is found inscribed on the third pentacle of the planet Venus. Diniel An angel who is one of the 70 child bed amulet angels. He is also a spellbinding angel in "the binding of the tongue of the ruler." Djin Helper of the Archangel Gabriel. He is an Elemental King, sphere of fire. He looks somewhat elderly, yet has great muscles. He has flames for hair and is a King of Fire. He can teach you the ways to use fire in magickal workings. He can also bring rituals that you never knew existed and give them to you as gifts. *From the Koran - The Djin (Jinn) are a race of beings created by Allah to serve Him. They are not His children, nor are they deities. They were created from searing hot, smokeless fire, some time before humans were created from clay. Since the Koran also states that the Angels were created from fire, it would seem that the Djin and the Angels are the same kind of beings. However, it is rare that the Koran speaks of "Angels and Jinn" in the same sentence, but often speaks of "Men and Jinn" in one breath. It would seem that the Jinn have a strong interest in consorting with humans, and especially in helping them to stray from the one-true-God. Not entirely, though, as there is at least one reference to Jinn who are righteous and hear the Word of Allah. With those exceptions, we expect that most humans and most Jinn will get their "come-uppance" on judgement day and they (we) will not be pleased with the results. In summary, it would appear that according to the Koran, the Jinn are a species related to Angels which tend to consort with human-kind to the detriment of both. Exceptions noted. Donel One of the numerous angelic guards of the South Wind. Druiel One of the numerous angelic guards of the South Wind. Eheres - An angel invoked in the exorcism of wax. Eiael An angel with dominion over the occult sciences and longevity. When Eiael is evoked the the invocant must recite the 4th verse of Psalm 36. Eirnilus An angel with dominion over fruit. He serves also as one of the genii of the sixth hour. Eistibus A genius of divination, one of the genii of the fourth hour. El Auria Angel of flame and is equated with Ouriel or Uriel. El El One of the angelic guards of the north wind. Elimiel In Jewish cabala, the angel (spirit intelligence) of the moon. Eloa A female angel said to have been born from a tear that Jesus shed. Enejie An angel of the seal invoked in magical rites. Espiacent An angel used in exorcism of wax for bringing about successful accomplishments of ones work. Psalms must be cited after rites of exorcism. Eth (Time) An angelic power, a ministering angel, charged with seeing to it that "all events occur at their appointed time." Eurabatres An angel of the planet Venus. Ezgadi An angel's name used in conjuring rites for the successful completion of journeys. Fabriel An angel serving in the 4th Heaven. Faith One of the 3 theological virtues (with hope and charity) depicted as angels by the 15th century Florentine masters..
Famiel A Friday angel of the air. Famiel serves in the third heaven and is evoked from the south. Fanuel (Phanuel) On of the 4 angels of the presence, as noted in Ezra IV, where Fanuel is said to be "Uriel under another aspect." But see Ramiel, the Shepherd of Hermes, etc. Farun Faro Vakshur In ancient Persian theogony, the protecting angel of mankind. Cf. Metatron in Judaeo-Christian occult lore, where he is often referred to as the "sustainer of mankind." Farvardin - Angel of March (in ancient Persian lore). Farvardin also governed the 19th day of each month. He is called "one of the Cherubim." Favashi - (Pravashi, Farohars, Ferouers, Fervers, Farchers) --in Zoroastrianism, the celestial prototype of all created beings, the guardian angels of believers. They possessed a dual character of nature: angels on the one hand and, on the other, beings with human qualities, attributes, and thoughts. They were the fravardin of the Zend-Avesta, "female genii dwelling in all things and protectors of mankind." In Jacob Easserman's novel Dr. Kerkhoven, the favashi are defined as "part of the human soul yet independent of the body. . . neither are they assigned to one and the same body; they may find themselves another body, provided it belongs to the pure." Flaef In the Cabala, an angelic luminary concerned with human sexuality. Flames An order of angels, "one of the classes in Talmud and Targum," says Volatire in his "Of Angels, Genii, and Devils." Chief of the order is Melba who, in Buddist theogony, is identified with the Judaeo-Christian angel Michael. Forcas (Foras, Forras, Furcas, Fourcas) - In occult lore it is not indicated what rank Forcas once held in the angelic hierarchy, or to what order he belonged; but he is a fallen angel; in Hell he is a renowned president or duke; and here he devotes his time to teaching rhetoric, logic, and mathematics. He can render people invisible; he knows also how to restore lost property. Forces - In the view of John of Damascus, forces constitues an angelic order sometimes identified as powers, sometimes as virtues or authorities. John of damascus places forces 3rd in the 2nd triad of the 9 choirs. their special duty is or was to govern earthly affairs. Forfax (Morax, Marax) In Scot's Discoverie of Witchcraft, a great earl and president of the underworld in command of 36 legions of spirits; he gives skill in astrinomy and liberal arts. He is also called Foraii. Manifest in the form of heifer. His sign is reproduced in Shah, The Secret Lore of Magic. Forneus Before he fell, Forneus was of the order of thrones and partly also of the order of angels. In the underworld he is a great marquis, with 29 legions of infernal spirits ready to carry out his commands. In addition to teching art, rhetoric, and all languages, he cause men to be loved by their enemies. It is said that he is involked, Forneus manifest in the form of a sea monster. Fourcas [Forcas] A Tuesday angel of the 5th Heaven, involked from the north. Framoch In Waite,The Lemegeton, an angel of the 7th hour of the night, under Mandrion. Friagne In occult texts generally, a Tuesday angel serving in the 5th Heaven and involked from the east. Fromezin An angel of the 2nd hour of the night under the command of Farris. Fromzon Angel of the 3rd hour of the night. Fuleriel An angel of the 6th hour of the night, serving under Zaazonash. Furlac An angel of the earth. Furmiel An angel of the 11th hour of the day, serving under Bariel. Fustiel An angel of the 5th hour of the day, serving under Sazquiel. Gaap (Tap) Once of the order of potentates (powers), now a fallen angel, Gaap serves, in Hell, as "a great president and a might prince." As a King of the south, he rules 66 legions of infernal spirits. Gabamiah In Solonic goetic rites, a great angel involked by the use of the incantary power of the name of the angel Uriel Hebrew: Pet form of Gabriella, name of an angel. Gabi Hebrew: Pet form of Gabriella, name of an angel. Gabriel ("God is my strength") One of the two highest ranking angels. He is the angel of mercy, annunciation, resurrection, vengeance, death and revelation. He presides over paradise and is the ruling angel of the first heaven. This archangel is a primary messenger of God, bringing divine announcements and revelations to humankind, acting as an intermediary between heaven and earth and helping us to interpret our dreams and our visions. Gabriel grants wishes and hopes to mortals, as well as joy, mercy, understanding of mysteries, truth, justice, miracles and love. 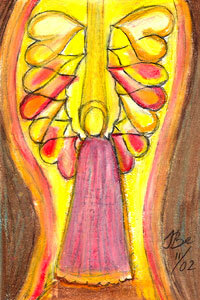 Essene prayer: "Gabriel, Angel of Life, enter my limbs and give strength to my whole body". Gabuthelon An angel whose name was revealed to Esdras as among the 9 who will govern "at the end of the world." Apart from Gabuthelon, the others are: Michael, Gabriel, Uriel, Raphael, and Aker, Arphugitonos, Beburos, Zebuleon. Gader In hechaloth lore (Ma'asseh Merkabah), an angelic guard stationed at the 4th angelic hall. Gadiel A "most holy angel" involked in goetic operations, as directed in Mathers, The Greater Key of Solomon, Gadiel is a resident of the 5th Heaven. Gadiel is one of numerous angelic guards of the gates of the South Wind. The fact that Gadiel's name is found inscribed on an oriental charm (kamea) suggests that he must have been regarded as a power to protect the wearer against evil. Gadreel (Gadriel--Aramaic, "God is my helper") - It was Gadreel who, reputedly, led Eve astray -- which, if true, would make Gadreel rather than Satan the talking serpent and seducer in the Garden of Eden. Like Azazel, Gadreel made man familiar with the weapons of war. Gadriel Chief ruling angel of the 5th Heaven in charge of wars among nations. [see Gadreel.] When a prayer ascebds to Heaven, gadriel crowns it, then accompanies it to the 6th Heaven.Galearii are the lowest ranking angels. Ga'ga In hechaloth lore (Ma'asseh Merkabah), an angelic guard stationed at the 7th heavenly hall. Gaghiel an angelic guard of the 6th Heaven. Galdel A Tuesday angel resident of the 5th Heaven; he is to be involked from the south. Galearii (Army Servants) Galearii are the lowest ranking angels. Gale Raziya One of the many names of the angel Metatron. Galgal(l)im ("sheres") - A superior order of angels of a rank equal to the seraphim. The galgallim are called "the wheels of the Merkabah" and are equated with the order of ophanim. There are 8 ruling angels in the order, with Galgiel or Rakbiel generally designated as chief. The galgalim share with the other Merkabah angels in their performance of the Celestial Song. Galgaliel Eponymous head of the order of galgalim (chariots of the Merkabah); chief angel of the wheel of the sun. Galizur - (Hebrew, "revealer of the rock"--Gallitzur, Gallizur, Raziel, Raguil, Akrasiel) - One of the great angels in Talmudic lore whom Moses encountered in Heaven, as related by Simon ben Lakish. It was Galizur, "surnamed Raziel,' who is reputed to have given Adam The Book of the Angel Raziel. He is aruling prince of the 2nd Heaven and an expounder of the Torah's devine wisdom. "He spreads his wings over the hayyoth lest their fiery breath consume the ministering angels." Galmon In hechaloth lore (Ma'asseh Merkabah), an angelic guard stationed at the 4th heavenly hall. Gamaliel - (Hebrew, "recompense of God") - In the cabala and gnostic writings, one of the great acons and luminaries, a beneficient spirit associated with Gabriel, Abraxas, Mikhar, and Samlo. However, Levi rates Hamaliel, as evil, "an adversary of the cherubim" serving under Lilith (who is the demon of debauchery). In the Revelation of Adam to His Son Seth (a Coptic apocalypse), Gamaliel is one of the high, holy celestial poers whose mission is "to draw the elect up to Heaven. Gambriel One of the gusrdian angels of the 5th Heaven. Gamerin In ceremonial magical rites, an angel called in for special service, according to Waite, The Ceremonial Book of Magic. The name Gamerin should be engraved on the Sword of the Art, before the start of the conjuring rite. Gamidoi A "most holy angel" of the 1st hour of the night. Gamiel Sipreme ruling angel of the 1st hour of the night. Gamorin Debabbin (Gamerin) An angel involked in the conjuration of the Sword. Gamrial One of the 64 angel wardens of the 7 celestial halls. Gamsiel Angel of the 8th hour of the night, serving under Narcoriel. Ganael One of the 7 planetary rulers (Electrons) serving under the joint rule of the angels Apudiel and Camael. Gardon An angel involked in the benediction of the Salt, according to Mathers. Garfiel (Garfiel) One of the guardians of the 5th Heaven. Gariel An angel of the order of shinanim, according to Hayim Haziz, "The Seraph," The Literary Review, Spring 1958. In Hechalotgh Rabbati, Gariel is and angelic Guard of the 5th Heaven. Garthiel Chief officer angel of the 1st hour of the night, serving under Gamiel. Garshanal An angelic name found inscribed on an ornimental charm (kamea) for warding off evil. Gaspard A spirit invoked in magical rites to procure to the the invocant a lady's garter. Gastrion An angel of the 8th hour of the night, serving under Narcoriel. Gat(h)tiel One of the angelic guards of the 5th Heaven. Gauriil Ishliha A Talmudic angel who presides over the east. His duty is to see to it that the sun rises every morning at the right time. Gauriil also appears in Mandaean lore and corresponds to the Zoroastrian Sraosha or to the Hebrew Gabriel. Gaviel With Gargatel and Tariel, Gaviel serves as one of the 3 angels of the summer. Gavreel (Gavriel) A variant for Gabriel used by the Ethiopian Hebrew Rabbinical College of the Black Jews of harlem (New York). To this sect there are 4 cardinal angels (of whom Gavreel is one) and they are to be involked for the curing of disease, the restoring of sight, turning enemies into friends, and "keeping the invocant from going crazy in the night." The other 3 cardinal angels are Micharel (for Michael), Owreel (for Uriel), and Rafarel (for Raphael). Gavreel is one of the numerous angelic guards of the gates of the East Wind. In hechaloth lore (Ma'asseh Merkabah), he is an angelic guard stationed either at the 2nd or 4th heavenly hall. Gazarniel An angel of "flame of fire" who sought to oppose and wound Moses at the time that the Lawgiver visited Heaven. Moses routed Gazarniel, we are told, "by pronouncing the Holy Name consisting of 12 letters." Gazriel one of 7o childbed amulet angels. Gebril An angel involked in conjuring rites. Geburael (Geburah) A sefira of the Briatic world. who figures frequently in cabalistic conjuring operations. In The Ancient's Book of Magic, Geburah or Geburael (meaning strength) is equated with Gamaliel and it is said that the influence of Elohi (God) "penetrates the angel Geburah (or Gamaliel) and descends through the shere of [the planet] Mars." Geburah or Geburael ("devine power or strength") - An angel who is the upholder of the left hand of God. In occult works, Geburah is usally listed as 5th of the 10 holy sefiroth (devine emanations). He is also the order of serphim. Identified variously as Gamaliel, Khamuel (Camael) and, in Isaac ha-Cohen of Soria's text, as Geviririon. Geburathiel The angel of gegurah. In 3 Enoch ((the Hebrew Enoch), Geburat(h)iel is one of the great angel princes represnting " the divine strength, might, and power." He is the chief steward of the 4th hall inthe 7th Heaven. Gedael (Giadaiyal, "fortune of God") In Enoch I Gedael is an angel of one of the seasons. Cornelius Agrippa cites Gedael (Gediel) as a governing angel of the zodiac. Gedariah A supervising chief angel of the 3rd Heaven. He ministers three times a day; he bows to prayers ascending from the second heaven, crowns such prayers, then transmits them for further ascent. Gedemel a spiit of Venus, of which planet the angel Hagiel is the presiding intelligence, according to Patacelus in his doctrine of Talismans. Gediel (Gdiel) Is one of the chief princes in the 4th chora or altitude. In An angel involke din conjuring rites. Gedobonai An angel of the chora or altitude involked in magical prayer. Gedudiel In hechaloth lore (Ma'asseh Markabah), an angelic guard stationed at the 7th heavenly hall. Gedudim A class of angels of the Song-Uttering Choirs under the leadership of Tagas. Gedulael - One of the sefiroth (divine emanations) involked in cabalistic rites. Gehatsita In hechaloth lore (Ma'asseh Merkabah), an angelic guard stationed at the 5th heavenly hall. Gehegiel An angel guard of the 6th Heaven. Gehirael In hechaloth lore (Ma'asseh Merkbabah), an angelic guard stationed at the 7th heavenly hall. Gehorey In hechaloth lore (Ma'asseh Merkbabah), an angelic guard stationed at the 7th heavenly hall. Gehoriel In hechaloth lore (Ma'asseh Merkbabah), an angelic guard stationed at the 1st heavenly hall. Gehuel In hechaloth lore (Ma'asseh Merkbabah), an angelic guard stationed at the 6th heavenly hall. Geliel One of the 28 angels governing the 28 mansions of the moon. Gelomiros An angel of the 3rd chora or altitude involked in magical prayer, as set forth in The Almadel of Solomon. Geminiel On of th governing angels of the zodiac. Gemmut Is an archon who serves under the rulership of Kalapatauroth (who causes all icons and all destinies to resolve). Genaritzod A chief officer-angel of the 7th hour of the night, serving under Mendrion. Genii of Fire In occultism, there are 3 genii of fire: Anael, king of astral light; Michael, king of the sun; and Sammael, king of volcanoesAn angel of the order of powers. Genius (pl. genii) Another name for angel or spirit or intelligence and "administer justice to the wicked, and suffering to the righteous." Geno An angel of the order of powers. Genon An angel of the second chora or altitude involked in magical prayers. Gergot In hechaloth lore (Ma'asseh Merkabah), and angelic guard stationed at the 6th heavenly hall. Germael ("majesty of God") An angel sent by God to create Adam from the dust--a mission also ascribed to Gabriel. Geron Like Genon and Gereimon (q.v. ), one of the angel of the 2nd chora or altitude involked in magical prayer. Geroskesufael in hechaloth lore (Ma'asseh Merkabah), an angelic guard stationed at the 7th heavenly hall. Gerviel (Cerviel) In Jewish cabal, the preceptor angel of King Davis. As Cerviel, this angel is chief of the order of principalites (clohim), sharing the post with Haniiel, Nisroc, and others. Gethel An angel set over hidden things. Geviririon An angel symbolizing or personifying geburah (fear or strength), Gerviririon ranks 5th of the 10 holy sefiroth. Geviriyah One of the many names of the angel Metatron. Gezuriya - In Malache Elyon, an angel of the order of powers; he is a guard of one of the celestial halls (hechaloth) and ruler over 6 other angels, among them the angel of the sun, Gazatdiya. Gheoriah An angel of the order of powers. Giatiyah One of the many names of the angel Metatron. Gibborim ("mighty ones") An order of angels of the Song-Uttering Choirs under the leadership of Tagas. "They are the might ones. . . .men of name. " The gibborim are genarlaly regarded as evil. Gidaijal (Gedael--"fortune of God") - A luminary of the seasons, as listed in Enoch I. He is the leader of the heads of thousands. Giel The angel with dominion over the zodiac sign Gemini. Gippuyel One of the many names for the angel Metatron. Glaras An angel of the 1st hour of the night, serving under Gamiel. Glauron or Glaura A beneficent spirit of the air, involked from the North. Glmarij An angel of the third hour of the day. Gmial One of the 64 wardens of the 7 celestial halls. Goap Formerly an angel of the order of powers; now fallen and in Hell. Goap is one of the infernal regions' 11 presidents. He is also known as Gaap and tap. Golab ("incendiaries") one of the adversaries of the seraphim, one of the 10 unholy sefiroth "whose cortex is Uriel." Golab has also been denoted a spirit of wrath and sedition, operating under hisa chief, Sammael the Black. Golandes - An angel involked in the excorcism of Wax. Gonael One of the numerous guards of the gates of the North Wind. Gonfalons order of angel in the celestial hierarchy. Rafael speaks of "Standards and ganfalons" who "for the distinction serve/Of hierarchies, of Orders, and Degrees." Gotzone (goh-tsoh-nee) - Basque: Angel, messenger. Gradhiel [Gradiel] Gradiel (Gradhiel, Graphiel--"might of God") - intelligence (angel) of the planet Mars when this luminary enters the signs of the Ram and Scorpio. gradiel's corresponding angel (for Mars) is Bartyabel (q.v.). Graniel An angel of the 2nd hour, serving under Anael. Granozin An angel of the 2nd hour of the night, serving under Farris. Graphathas "One of the 9 angels that run together throughout the heavenly and earthly places," where tha names of the 9 angels are revealed by Beliar to Bartholomew. Graphiel (Gradiel) A spirit in cabalistic enumerations answering to Babriel, according to Forlong, Encyclopedia of Religions. Grial (Griel) A guardian angel of the 5th Heaven; also one of the 70 childbed amulet angels. Grogori (egoroi, egregori,"watchers") In Jewish legendary lore, the grigori are a superior order of angels in both the 2nd and 5th Heaven (depending on whether they are the holy or unholy ones). They resemble men in appearance, but are taller than giants, and are eternally silent. Ruling prince of the order is Salamiel "who rejected the Lord." Guabarel An angel of autmn. In addition to Guabearel, another angel cited in occult lore as governing autumn is tarquam (q.v.). Guael (Guel) - An angel of the 5th Heaven ruling on Tuesday, Guael is involked from the east. Gulacoc An angel of the Seal, used for conjuring. Gulahab 5th of the 10 unholy sefiroth, as noted in Moses de Burgos' text. Gurid A summer equinox angel. Effective when invoked as an amulet against the evil eye. Guriel ("whelp of God") one of the angel ruling the zodiacal sign of Leo. Gurson - (Gorson or Gorsoyu) one of the routed forces under Lucifer, now serving in the nether regions as king of the south. Gutrix In occultism, a Thursday angel of the air, ministering to Suth, chief of these angels, all of whom are subject in turn to the South Wind. Acting with Gutrix is Maguth, who likewise ministers to Suth. Guziel In M. Gaster, The Sword of Moses, an evel angel summoned in incantation rites against an enemy. Gvurtial An angelic guard of one of the great halls (or Places) of the 4th Heaven. Gzrel In Tracthenberg, Jewish Magic Supersition, an angel involked to countermand evel decrees. The word Gzriel is part of a 42-letter name of God. Haael One of the 72 angels of the zodiac. Haaaiah An angel of the order of dominations. Haaiah rules over diplimacy and ambassadors, and is one of the 72 angels bearing the name of God Shemhamphorae, Haaiah sigil is reproduced in Ambelain, La Kabbale Pratique. Haamiah An angelic of the order of powers. Haamiah domiates religious cults and "protects all those who seel the truth." Haarez An angel of the Seal, as noted in The Sixth and Seventh Books of Moses. Haatan A genius wh conceals treasures, according to Apollonius of Tyana, The Nuctecemeron. Habbiel (Habiel) A Monday angel of the first heaven. An angel who is appealed to for loyal love and romance, invoked in love charms. Habriel An angel of the order of powers, summoned in conjuring rites. Habudiel In ocultism, an angel of the Lord's Day, resident of the 4th Heaven. He is involked from the south. Habu(h)iah An angel who exercises dominion over agriculture and fecundity. Habuhiah is one of the 72 angels bearing the name of God Shemhamphorae. Hachashel One of the 72 angels of the zodiac. Hadakiel He governs the sign of libra. Hadar The superior Benignity" anoceived of by cabalists as a sefira. Hadariron An archon named in lesser hechloth lore and in the Alphabet of Rabbi Akiba. Hadarmiel A holy angel named in Mathers, The Great Key of Solomon. Hadasdagedoy In hechaloth lore (Ma'asseh Merkabah), an angelic guard of the 6th heavenly hall. Hadraniel (Hadarniel, Hadariel, Hadriel--majesty of God") A porter angel stationed at the 2nd gate in Heaven (according to one view). He is taller than Kamuel "by 60 myriads of parasangs" but shorter than Sandalphon "by a 500 years' journey." In gnosticism Hadraniel, great as he is, is "only one of the 7 suborndinates to Jehudiel, prince of fire." As Hadriel, he serves among the numerous angelic guards of the gates of the East Wind. In Sefer ha-Heshek he is also one of the 72 names (actually more than 100) of Metatron. In 3 Enoch, Odeberg holds that it is possible for Hadraniel to be identified with Metatron and that he has indeed so identified in apocalyptic literature. Hadriel (Hadraniel) Equate with Pusiel in Revelation of Rabbi Joshua Ben Levi. Hadrion A variant form of Hadariron. Haduriel In hechaloth lore (Ma'asseh Merkabah), an angelic guard stationed at the 6th heavenly hall. Hadiririon "The beloved angel of God," who may be involked in ritual magic rites. Hadiya(hay-dee-yah) - Arabic: Guide to righteousness; gift. Hafaza In Muslim lore, a term denoting angels, The hafaza constitute a special class, are 4 in number, and "protect man from jinn, men and Satans." On these 4 angels devolves the duty of writing down the actions of mortals. Hafkiel - In Montgomery, Aramaic Incantation Texts from Nippur, and angel involked in the exorcism of demons. Hagai - In hechaloth lore (Ma'asseh Merkabah), an angelic guard stationed at the 5th heavenly hall. Hagedola An angel of The Seal, involked in ceremonial rites. Haggai a minor Hebrew prophet called "God's messenger or angel." Haggo An angel of the Seal who could be summoned in conjuring rites, like Hagedola. Hagiel The intelligence of Venus when that planet enters the signs of Taurus and libra. Hagaiel's cabalistic number is 49. His corresponding angel, the spirit ruler of Venus, is Gadamel. Hagios The name of a great, or one of the secret names of God. Jael One of the twin Cherubim on the Mercy Seat of the Ark of the Covenant, the other cherub being Zarall. Jael is an angel governing the sign of Libra. Janiel Angel of the fifth Heaven, ruling on Tuesday and subject to the East Wind. Jariel An angel of divine face or prescence. A varient form of Rziel, Suriel or Sariel. Jazar A genius who "compels love". Also of the 7th hour of the day. Jeduthun or Jeduthum (Praising or Judgement) He is lord of the evening choirs in heaven. As the master of howling, he leads myriads, (1,550) of angels in chanting hymns of praise of God at the close of each day. The leader of the "Lords of shouting", "all singing glory to the lord". It is said that at dawn, because of chanting of the lords of shouting, judgement is lightened and the world is blessed. Jehoel (Jaoel) Mediator of the eneffable name; prince of the presence. Jeliel A seraph whose name is inscribed on the tree of life. He is the heavenly prince ruler of Turkey. He controls the destiny of kings and other high dignitaries and gives the palm of victory for those who are unjustly attacked or invaded. In addition he inspires passion between the sexes and insures marital fidelity. Jerazol An angel of power mentioned in cabalistic works. He is invoked in conjuring rites. Jeu Jeu is the great angel, overseer of light and arranger of the cosmos. He is one of the 3 great powers on high. Occupying the right place on God's side with Propator on God's left. Jophiel (Creative Power) Teaches our consciousness to discover the Light within. Joustriel Angel of the 6th hour of the day. Jukar A prince over all the angels, according to Mathers.Kabniel - An angel invoked to cure stupidity. Kabshiel An angel who, when conjured up and agreeable with the invocant confers grace and power. Kadi(el) A Friday angel invoked from the west and serving in the third heaven. Katzfiel An angelic Prince of the sword and guard of the sixth heaven. Katfiel's sword emits lightening! Kfial One of the 64 angel wardens of the seven celestial halls. Kokaviel The name of the angel found inscribed on the third pentacle of the planet Mercury. Kutiel An angel invoked in connection with using divining rods. Kyriel One of the 28 angels governing the 28 mansions of the moon. Kabniel An angel invoked to cure stupidity. Kabshiel - An angel who, when conjured up and agreeable with the invocant confers grace and power. Labezerin The spirit of success. He serves in the second hour of the day. Lamach An angel who exercises dominion over the planet Mars. Larzod One of the "glorious and benovolent angels" invoked in Solomonic conjuring rites for imparting to the invocant some of the wisdon of the Creator. Lazai An angel invoked in the exorcism of fire. Lelahel An angel of the zodiac exercising dominion over love, art, science and fortune. We appeal to this being of light for good luck and good fortune. Leliel One of the angelic rulers of the night! Lepha Angel of the seal. Little Lao One of the many names given to Metatron. Liwet This angel presides over vanguard ideas and inventions. He is es- epecially protective of mortals who have original ideas and thoughts, and is also very encouraging of individuality and uniqueness. Luel An angel invoked in connection with the use of diving rods. Mach An angel called up in Solomonic conjuring rites to render the invocant invisible. Madan An angel the exercises dominion over the planet Mercury. Mador An angel stationed at the fourth heavenly hall. Mael A ruling Archangel of the water. He is also one of the inteligences of the planet Saturn and is a Monday angel of the first Heaven. He may be invoked from the North. Mahariel (Swift) An angel of Paradise stationed at the first portal. He provides new souls for the purified ones. Mahzian A spirit who bestows sight. Maion An angel with dominion over the planet Saturn. Maktiel An angel with dominion over trees. Maltiel A Friday angel resident in the third heaven and invoked from the West. He is also one of the intelligence's of the planet Jupiter. Maltiel is the preceptor angel of Elijah and serves as one of the numerous guards of the West wind. Manakel Angel of aquatic animals. Maroch An angel of the 5th hour of the day. Mastho Is a genius of delusive appearances. He is one of the spirits of the tenth hour. Mebahiah An angel who exercises dominion over morality and religion. He also helps those desiring offspring. Mehiel An angel who protects university professors, orators and authors. Melioth One of nine angels that run together throughout heavenly and earthly places. Melkajal Angelic ruler of March. Memuneh (Appointed one) A deputy angel, a dispensr of dreams. It is said through the Memuneh, the Universe operates. Mercury The angel of progress. Meriarijim A chief officer-angel of the night. Messiach An angel invoked in magical operations in connection with the invoaction of water and hyssop. The invocant is advised to resite the versicles of the Psalms 6, 67, 64 and 102. Metatron Chancellor of heaven, prince of the ministering angels. He is charged with the sustenance of mankind. He has been known as the link between the human and the divine. The angel who wrestled with Jacob. (Genesis 32), As the watchman (Isaiah 20) Also see Exodus 23:20 for this refers to Metratron as well. Metatron, according to the cabala is the angel said to have lead the children of Israel through the wilderness. His female equivalent is Shekinah. His twin brother is Sandalphon. After arriving in heaven he was transformed into a spirit of fire and equipped with 36 pairs of wings as well as innumerable eyes. He resides in the 7th heaven and when evoked appears as a pillar of fire said to be more dazzling than the sun. He has many other names that he is called by. He has also been credited with the authorship of Psalms 37:25. He is the supreme angel of death to whom God gives daily orders as to the souls to be taken. He then delegates these orders to his subordinates, Gabriel and Sammael. Metatron is considered by some to be mightier than Michael or Gabriel. Metatron is the teacher of prematurely dead children in Paradise. Micah (Divine Plan) Watches over spiritual evolution, seeking every opportunity to reveal the next steps of your life purpose. Michael Chief angel, deliverer of the faithful, tutelary prince of Israel. An angel who grants miracles, fosters mercy, repentance, truth, sanctification, blessing, immortality, patience and love to human-kind. This archangel is protective of those who are just and good. Angel of insomnia. He strengthens our spirits in difficult times. Pray to Michael for these gifts and virtues. Essene prayer: "Michael, Angel of Earth, enter my generative organs and regenerate my whole body." Midael A chief and Captain in the celestial army. An angel of the order of warriors. Mihr - An angel presiding over the month of September and the 16th day of the month. Mihr watches over friendship and love. Miniel A great angel whose chief virtue is that he can, when invoked, induce love in an otherwise cold and reluctant maiden. For best results he must be invoked while the invocant is facing south. Mirthra He rises from paradise in the great East, has 1,000.00 ears and 10,000.00 eyes.He is also called the god of light and in heaven assigns places to the souls of the just. Mizan An angel invoked in Arabic incantation rites. Mizgitari The genius of eagles. And he serves the seventh hour of the day. Moakkibat In Muslim religion Moakkibat is the recording angel. He writes down men's activities. Modiniel One of the spirits of the planet Mars. Morael An Angel of awe or fear. He rules over August and September. He has the power of making everything invisible. Mordad Angel of death, according to Persian point of view. Mqttro An angel that ministers to the son of man. Mumiah This angel presides over the sciences of medicine and physics. Mumiah is traditionally believed to grant health and longevity, as well as being able to suspend physical laws to create miracles. Munkir and Nakir According to the Islam tradition there are the angels, Munkar and Nakir, who question the person in the grave. They visit the tombs of those who have recently died. They are to determine where the deceased will go, to Paradise or to Hell. They ask questions regarding the religious beliefs of the individual, and also their good and evil deeds on earth. The good are shown what life will be like in Heaven. The bad are shown the torments of Hell. Mupiel (Out of the Mouth of God) An angel invoked for obtaining a good memory and an open heart. Mutuol An angel invoked in the consecration of Pen & Ink, a powerful device for the binding of evil spirits, or the exorcising of them.Naadame - Prince over all the angels and Caesars. Nafriel An angelic guard of the gates of the South Wind. Nakir and Munkir According to the Islam tradition there are the angels, Nakir and Munkir, who question the person in the grave, They visit the tombs of those who have recently died. They are to determine where the deceased will go, to Paradise or to Hell. They ask questions regarding the religious beliefs of the individual, and also their good and evil deeds on earth. The good are shown what life will be like in Heaven. The bad are shown the torments of Hell. Nariel governs the South Wind. He is also the ruler of the noonday winds. Narsinha A man-lion avatar. He is lord of heroism. Natiel An angel with the power to ward off evil who's name was found in the charm called kamea. Nehinah An angel invoked in necromatic operations. Nemamiah This sacred being is a guardian angel of all those who fight for just causes. He is especially protective towards people who defend the rights of those who cannot defend themselves, such as animals and children. When an injustice is done towards anyone, including ourselves, we can pray to Nemamiah to right the wrong. Neriel One of the 28 angels who govern one of the 28 mansions of the moon. Nesanel Along with the angels Meachuel and Gabril, is summoned to free or purge the invocant of all sin. Nisroc (Freedom) Known as "the great eagle." His flight into the Heavens is the symbol of freedom. On the physical plane, there is freedom to travel where you want & be safe from harm, to be able to say what you feel and make choices for yourself. As you go deeper into your awareness, freedom becomes the ability to feel the unconditional love for the Eternal. Nithaiah A poet angel of the order of dominations. He is invoked by pronouncing any of the divine names along with the 1st verse of Psalm 9. He is in charge of occult sciences, delivers prophecies in rhyme, and exercises influence over wise men who love peace and solitude. Nitika A genius of precious stones and he precides over the 6th hour of the day. Noaphiel An angel whose name is inscribed in Hebrew characters on the fifth pentacle of the planet Saturn. In conjuring Noaphiel, the invocant is advised (for best results) to recite a versicle from Deuteronomy 10. Novensiles The nine great dieties who control thunderbolts! Tina, Cupra, Menrva, Summanus, Vejovis, Sethlans, Mars, Mantus and Ercle. They are angels who watch over the renewing of things and they have the power to wield thunderbolts! Och Angel of the sun. Och gives the invocant 600 years of perfect health. (If they live that long) He is also the ruler of 28 of the 96 Olympian provinces into which heaven is divided. He is a mineralogist and cited as the "prince of alchemy". Oertha An angel of the north. "He hath a torch of fire and putteth it to his sides, and they warm the great coldness of him so that he freeze not the world." Olinda Old German: Protector of property. Omael An angel who multiplies species, perpetuates races and influences chemists. There is some question as to whether Omael is a fallen or upright angel. Data available suggests he seems to operate in both domains. Omniel This being of light grants to mortals the ability to experience a feeling of oneness with all life. We pray to Omniel to lift the veil of illusion that keeps us separate from other living beings. When this veil lifts we find that the concept of doing to others as we would do to ourselves becomes real, for we truly are all one. Omophorus A world supporting angel. He carries the earth on his shoulders, like atlas. Onayepheton The name of a spirit by which God will summon the dead and raise them to life again. Onzo A fair angel of God" invoked in the exorcism of wax. Opiel An angel who aids individuals in obtaining the love of a desired one. His name can be found written on Aramaic love charms. Oranir Chief Prince of the nine angels of the Summer Equinox and effective against the evil eye. Oriares The angel governing the season of winter. Oriel (Auriel, Light of God) Old French: Golden, Angel of Destiny. He is one of 70 childbed amulet angels. Ruler of the tenth hour of the day and he is called the angel of destiny. Osael A cherub summoned in ceremonial magic. Osgaebial An angelic ruler of the 8th hour, he commands "a great cloud of attending spirits". Otheos A most holy Angel invoked for discovering treasure. Ouestucati A female angel who brings the sea wind. Oul A special aid angel to Dalquiel in the third Heaven. Pagiel - An angel petitioned in ritual prayer for the fulfillment of the invocant's desires. Pahaliah An angel invoked to convert non christians to christianity. He rules theology and morals. Pancia A "most pure angel" invoked in ceremonial magic, specifically in the conjuring of the sword. Parasiel An angelic name inscribed in Hebrew characters on the first pantacle of the planet Jupiter, Parasiel is lord and master of treasures. Paschar (Vision) Guards the veil between our world and the heavens, between consciousness and unconsciousness, between awareness and illusion. Patteny A ministering angel summoned in cabalistic rites. Penat A Friday angel, residing in the third heaven and one of the intelligence's of Venus. Pendroz An angel of the seventh hour. Permaz An angel of the second hour of the night. Pesagniyah A supervisory angel of the south in charge of the keys to ethereal places. When prayers of persons in deep sorrow ascend, Pesagniyah kisses such prayers and accompanies them to a higher region. Pethel A "most holy angel" invoked in magical rites at the close of the sabbath. Phaiar An angel invoked in the conjuring of the reed. Phakiel - He controls the sign of Cancer in the zodiac. Phaldor A angel of oracles. Phanuel (Raguel) (Hope) Archangel of penance, prince of the presence, angel of hope, and holds the devil in his power. Hope is a feeling of trust & a desire for good, accompanied by the assumption that your desire is attainable. Identified with Uriel and Ramiel. Pharniel Angel over the 12th hour of the day. Phatiel Angel of the Fifth hour of the night. Phi-Re One of the seven planetary archangels and head of the order of virtues. Phul Lord of the moon, ruler of the seven Olympian Provinces. As a Monday angel, Phul is to be invoked only on Monday. Phul is called "Lord of the powers of the moon and supreme Lord of the waters." Poiel An angel of the order of principalities. He rules over fortune and philosophy. He also is one of the 72 angels of the zodiac. Porna A Friday angel serving in the third heaven invoked from the south. Presnostix An angel of the sixth hour of the night. Pruel An angelic guard of the gates of the South Wind. Prukiel An angel invoked in Syriac charms along with other spellbinding angels. Psychopompoi Soul-escorting angels who accompany souls after bodily death toward their heavenly abode. Michael, Elijah & Sandalphon are also regarded as guides of the Psychopompoi.Qaddis/Qaddisin (Holy Ones) - Twin angels who, with the Twin Irin, constitute the supreme judgment council of the heavenly court. Qadosch An angel invoked in the conjuring of ink and colors. Qafsiel An angel with dominion over the moon. He is the guardian of the seventh heavenly hall. In ancient hebrew magic he is invoked to drive away enemies by tying the charm, written in bird's blood, to the foot or wing of a dove and then bidding it to fly away. If it flies away, that is a sign that the enemy is also in flight. Qamiel An angelic guard of the South wind. Qaniel One of the numerous angelic guards of the South Wind. Queen Of The Angels In Catholicism, the Virgin Mary. In the Cabala, the Shekinah. In Gnosticism, the Pistis Sophia. Quelamia One of the seven exalted throne angels residing in the first heaven. Ra'asiel X Ra' asiel X is an angel invoked in ritual magic. Radueriel (Vretil) The heavenly register and recording angel, leader of the celestial choirs, creator of the lesser angels. He is also included among the 8 great judgement princes of the throne, whose rank is superior to Metatron's. He is the angel of poetry and master of muses. Of Raduriel it is said "out of every word that goeth forth from his mouth, a song uttering angel is born". *Since the creator alone has the power and the privilage to do likewise, this makes Radueriel unique among his fellow hierarchs*. Rael A Wednesday angel residing in the third heaven. He is also one of the intelligence's of the planet Venus. Invocant must face North when conjuring up Rael. Rahdar With the aid of his genious brother Phakiel, Rahdar governs the zodiac sign Cancer. Rain The angels who hold dominion over moisture and rain can be appealed to by repeating their names over and over in a chant: "Mathariel, Ridia, Matriel." These angels are especially protective of people who conserve water and can inspire humans to do so. We also pray to these sacred ones for renewal and regeneration. Rampel An angel who holds dominion over mountains. We pray to Rampel for inner strength, stability and endurance. When we climb a mountain, or simply gaze at a mountain, this angel is near. Raphael One of the princes of the presence and regent of the sun. This archangel is extremely healing to all living beings. Raphael grants joy, healing, love, miracles and grace. He inspires humankind to pray and is also protective of travelers, guarding and guiding those who take outward or inward journeys. Raphael also grants courage and encourages scientific breakthroughs and knowledge in general. 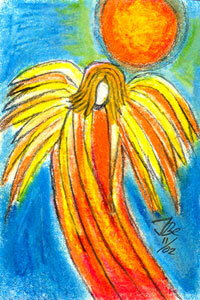 Essene prayer: "Raphael, Angel of Sun, enter my solar center and give the fire of life to my whole body." Rash An angel, minister of justice. Raziel (Galizur) The chief of the supreme mysteries, angel of secret regions, one of the archangelic governors of the Briatic world; preceptor angel of Adam, herald of deity, and reputed author of The Book of the Angel Raziel. Rehel An angel who battles against the enemies of religion. Remiel (Awakening) Each of us has a different concept of what it means to be awakened. The essence of what we all seek is divine love and freedom from pain and suffering. Remiel is the angelic awakener whose goal is to bring you to Higher Power... consciousness and union with with your Eternal self. Rhaumel A Friday angel of the fifth heaven, evoked from the north. Riehol In cabala, governor of the zodiacal sign of Scorpio, in this office Riehol is assisted by Sassaial. Rigziel In Isaac Ha-Cohen's text, "emminations of the left side". Rigziel is 8th of the ten holy Sefiroth. Rikbiel Chief of the divine chariot; prince of the Merkabah angels. Rochel An angel who finds lost objects. Rosabis A genius of metals. Ruchiel An angel appointed over the wind. Rudosor Angel of the sixth hour of the night. Rusvon An angel who holds the keys to the Muslim earthly paradise. Sabbath An angel who sits on the throne of glory in heaven, the chief of orders of angels do him honor. He is the lord of the sabbath. Sagdalon Governor of the sign Capricorn. Sahaqiel Angel of the sky. Salilus - In magical arts, a genius who opens sealed doors and is an angel of the seventh hour of the day. Sam Hii (Shom Hii) One of the ruling angels of the North Star. Then name means "Creation of life." Samandiriel This angel holds dominion over imagination and helps us realize that a vivid imagination is a very healing tool to have, because we can visualize and create alternative realities with which to trans- form our own lives as well as the world around us. Samax Chief of the angels of the air and ruling angel of the day Tuesday. Sameron An angel of the 12th hour of the day. Sandalphon (Co-Brother) (Power) - Originally the Phophet Elias. He is a Sarim, (angelic prince), angel of power and glory, twin brother of Metatron. Master of heavenly song. He is regarded as the tallest hierarchs in the celestial realm. Moses called him "the tall angel". Along with Archangel Michael, he carries on a ceaseless battle with the prince of darkness. He is the fancier of sandals. Also he is instrumental in bringing about the differentiation of sexes in the embryo, a good thing to bring to the attention of expectant mothers. He oversees the many powers given to the Seraphim including strength, abundance, beauty and joy of living. Sangrariel An angel who guard the portals of Heaven. Sarafinah Hebrew: Ardent, like the angel who protects God's throne in. Saranana An angel of the third altitude. Sarga One of the 5 heavenly scribes appointed by God to transcribe the 204 books dictated by Ezra. The other 4 scribes are Dabria, Seleucia, Ethan (or Ecus) and Asiel. Sarim Chief Celestial Angel Princes. Sarquamich An angel of the of the third hour of the night. Sasgabiel An angel invoked in the rites of exorcism. Savuriel An angelic guard of the third heaven. Schachlil Angel of the sun's rays. Schaltiel An angel who governs the sign of Virgo. Schrewneil An angel to be invoked for obtaining a good memory and an open heart. Sealiah An angel who governs or controls the earth's vegetation. Sebhael A spirit who is in charge of the books wherein are recorded the good and evil actions of man. Sedim They are guardian spirits, invoked in the exorcism of evil spirits. Seheiah An angel who provides protection against sickness and fire. He also governs longevity. Sekel A female angel who is the angel of part of an hour. She will appear when properly invoked. She dwells in Egypt. Selith One of the two guardian angels over the Virgin Mary and St. John the Divine. Seraquiel A "strong and powerful angel" who is invoked on Saturday. Sereda Mother Sereda has dominion over Wednesday. She is the one who "washes away all the colors in the world". She is the sister of Pandelis. Seth One of seven archons. Setheus One of the great celestial powers dwelling in the sixth heaven. Shcachlil Angel of the sun's rays. 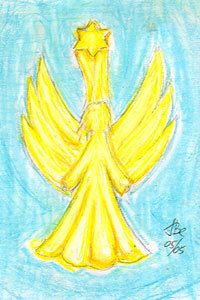 Shekinah (Liberating Angel) female angel of liberation and freedom. Always close to humankind, Shekinah inspires mortals to be just and fair. Some believe that she is the female part of creation, the feminine aspect of the Creator. She is especially healing of body, mind and spirit. Who delivers the world in all ages. She is very close to mankind and is never separated from the just. Shermuil The great archon, mediator between the prayers of Israel and the princes of the 7th heaven. Shetel One of three ministering angels whom God appointed to serve Adam. Some of their tasks were to roast his meat and cool his wine. Sizajasel an angel governing the sign of Sagittarius. Sofiel An angelic bookeeper appointed over the records of souls, living and dead. Sopheriel Mehayye and Sopheriel Memeth Two of the supreme angels of the Merkabah (of which there are 8); keepers of the books of life and death. Soqed Hozi (Partnership) - The keeper of divine balances, holding the balance of feeling and truth in our lives through our partners. One of the 8 supreme angels of the Merkabah, appointed by God to the Sword. Sphener - A celestial power invoked to combat Mardero, demon of disease. Splenditenes A world supporting angel. He supports the heavens on his back. He has six faces and mouths and "glitters with light". He is also called the monument of splendor. Stimulator An angel invoked in the exorcism of ink. Strateia An angelic host whom is said to have the power to cause stars to fall from the heavens. Sui'el An angel with dominion over earthquakes. Suriel Like Metatron, Suriel is a prince of presence and like Raphael, an angel of healing. He is also a benevolent angel of death, (one of a few). Suriel was sent to retrieve the soul of Moses. It is said that Moses received all his knowledge from Suriel, (although Zazagel is credited also with giving Moses his knowledge). He is one of the great Archangels. He is one of seven angels in the system of primordial powers. When invoked, he may appear as an ox. In Cabala he is one of the seven angels that rule the earth. Susniel An angel invoked in Syriac invocation charms. As a "spellbinding" power, Susniel is grouped with Michael, Azriel, Shamshiel and other angels.Tablibik - A spirit of fascination and one of the genii of the fifth hour. Tabris An angel of the sixth hour who presides over free will, self-determination, choice and alternatives. When you feel stuck in any situation, pray to this illumined one for the ability to see creative alternatives. Taharial - An angel of purity who is prayed to by those who need to cleanse their thoughts, spirits or surroundings. talia (tah-lee-uh) Hebrew: Heaven's dew, name of angel. Taliahad Angel of water. Talihad's name is found inscribed on the seventh pentacle of the sun. Tar One of the ten angels that accompany the sun on it's daily course. Tariel One of the three angels of summer. Tariel figures in Syrian incantation charms. He is invoked along with other spellbinding angels in the "binding of the tongue of the ruler". Tarot The angel of time. Stands between Earth and Heaven, clothed in white robe with wings of flame and a golden halo around his head. One foot on land the other, in the sea, behind him the sun rises and on his brow is the sign of eternity and life: the circle. Tarwan One of the 10 angels that accompany the sun on it's daily course. Teiaiel In Cabala, an angel that can fortell the future. He is a throne angel and controls maritime expeditions and commercial ventures. Temperance An angel with the sign of the sun on his forehead, on his breast the square & triangle of septenary. Pouring from one chalice into two essences which compose the elixir of life. Tetra An angel invoked in ritual magic prayer for the fulfillment of an invocant's desires. Tetra is noted to be a "great and glorious spirit"
Tezalel An angel involved with fidelity. Theliel An angelic prince of love invoked in ceremonial magic to procure the woman desired by the invocant. Thiel An angel serving in the second heaven but also serves in the third. He is the ruling prince of Wednesday and invoked from the North. He is one of the intelligence's of the planet Venus. Thoth An angel of the eighth hour of the night. Tilonas An angel invoked in the conjuration of ink and colors. Time An angel named so in the Tarot Number 14. He is winged, the sign of the sun on his forehead and the triangle of septenary on his chest. He pours the essence of life from one chalice to another. He is also called Temperance. In Ecclesiastes 9 and 12 he is referred to the ministering angel who presides over each act mans performs. Tixmion An angel invoked in the benediction of the salt. Torquaret An angel who procides over the season of Autumn. Trgiaob As an angel who protects wild birds, we pray to this illumined one to protect all birds from extinction, pollution and destruction of their habitat. Whenever you hear a bird sing, Trgiaob is near. Trsiel An angel who has dominion over rivers. Tsaphiel One of the angel governing the moon. Tual In ceremonial magic, one of the angel's representing Taurus the bull. Tubiel An angel invoked for the return of small birds to their owner. Also the head of the sign of Summer. Turmiel - One of the numerous angelic guards at the gate of the west wind. Tuwahel A ministering angel invoked in ritual magic. Tzadiqel The archangel who rules Jupiter on Thursday. Tzadkiel - Angel of divine justice. Ubaviel - An angel with the dominion over the sign of Capricorn. Uriel (Ministration) A patron angel of literature and music, Uriel bestows upon us the gift of creative fire, as well as the power of prophecy. We appeal to him for foresight into the future and for help in developing our psychic abilities. Uriel is an angel of transformation, archangel of salvation, regent of the sun, overseer of Tartarus, and is the spirit of ministration and peace. He helps turn our worst disappointments into our greatest blessings. Uriron - An angel invoked as an amulet against sorcery and sudden death. Urpaniel An angel's name found inscribed on an asian charm for warding off evil. Uvael A Monday angel, resident of the first Heaven and invoked from the North. Uwula A ministering angel invoked at an eclipse of the sun or moon. Uzziel (Strength of God) (Faith) Angel of the order of Virtues and Cherubim. Also one of the 7 angels who stand before the throne of glory and among the 9 who set over the 4 winds. Uzziel is commanded by Gabriel to "coast the south wind with the strictest watch" Also known as an angel of mercy, under the ruler ship of Metatron. When you invite Uzziel to touch you with faith, your spiritual growth is accelerated and peace fills your heart. Valoel It is traditionally believed that this perfect being holds dominion over peace. We pray to Valoel to enfold us with his wings of serenity and to fill our hearts with tranquility and contentment. Varcan An angel with dominion over the sun. He is referred to as the king of the angels of the air, ruling on the Lord's day. Vassago Invoked to discover a woman's deepest secret. He is a Prince of the nether realms where he busies himself finding lost possessions and fortelling the future. Vatale A prince over all the angels and Caesars. Veguaniel An angel ruler of the third hour of the day. Vehuiah One of eight seraphim invoked to fulfill prayers. He governs the first rays of the sun. Vel A resident of the third heaven. A Wednesday angel invoked from the south. Verchiel Angel of the month of July, ruler of the sign Leo, He is also one of the rulers of the order of powers (potentates, authorities, dynamis) He is also the governor of the sun. Vesta Latin: Guardian of the sacred fire. Vhnori One of the two governing angels of the sign Sagittarius. Vohal An angel of power invoked in conjuring rites. Vretil The archangelic keeper of the treasury of Sacred Books. He is said to be wiser than the other archangels. He is also called "the scribe of the knowledge of the Most High"
Wallim An angel serving in the 1st heaven. Weatta An angel of the Seal. Yahel - An angel who's name is inscribed on the fourth pentacle of the moon. Yarashiel One of the numerous angelic guards of the gates of the East Wind. Yefefiah (Dina) Angel of the Torah, instructed Moses in the mysteries of the cabala. Yekahel One of the spirits of the planet Mercury. His name is inscribed on the first pentacle of the planet. Yephiel The angels whose name is found on an Asian charm for warding off evil. Yrouel His name is found inscribed on amulets worn by women during pregnancy. Yroul is the angel of fear, a common angel. Yurkemi The angel of hail. A legend says that Yurkemi offered to extinguish the fire consuming the three men in the fiery furnace but Gabriel would not have it, contending that Yurkemi's help would not suffice. Zachriel An angel who rules over memory. Zadkiel (Prayer) An angel of solace, charity and gentleness. We pray to-this sacred one for comfort when we are in need of gentle guidance. Zadkiel also kindles a desire for spiritual development in humankind. He guards the powers of invocation; the best known and most powerful form: prayer. Zagzagel (Wisdom) Angel of wisdom, chief guard of the 4th heaven, angel of the burning bush. Teaches us how to listen and see inwardly. Wisdom is the result of searching deep within for truth. Zahariel (Brightness) A great angel invoked to resist temptations. Zalbesael (Heart of God) An angel who has dominion over the rainy season. Zaliel A Tuesday angel, resident of the 5th Heaven. He is invoked from the south. Zavael An angel who controls and has dominion over whirlwinds. Zeffar "The genius of irrevocable choice". He also serves at the 9th hour. Zehanpuryu'h (This One Sets Free) A great angelic prince: advocate general of heaven and dispenser of divine mercy. With Michael he is the dispenser of inerrable balances. He is one of the crown prices of the Merkaba with higher ranking than that of Metatron. Zeirna Genius of infirmities and genii of the fifth hour. Zephon (A Looking Out) Guardian prince of Paradise. The sixth sefira, one of the cheribum. Gabriel sent Zephon along with Ithuriel to find Satan. The found him in the garden of Eden while he was tempting Eve. Zizuph A genius of mysteries and one of the genii of the 8th hour. Zuphlas This angelic benefactor protects and safeguards the forests and trees. We appeal to this angel to save the rain forests of the earth and to inspire the human race to honor, respect and save the trees. Also the genii of the 11th hour. Dette kapitel indgår som en del af NetSpirits sektion om engle. Her kan du læse sådan cirka alt om engle - beskrivelse af de enkelte engle, englehierakiet, ærkeengle, skytsengle - kort sagt, søger du information om engle, så finder du det i NetSpirts sektion om engle.